..sláva hvězd.. was written especially for the Czech pianist Tomáš Klement as a thank you for his wonderful interpretation of Coretta (2017). 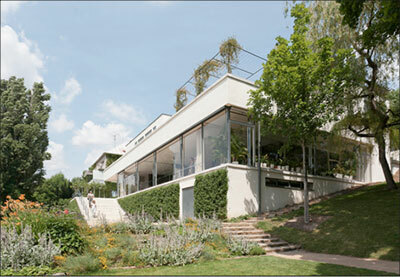 Tomáš recorded ..sláva hvězd.. for Czech Radio 3 on 28 September 2018 and is giving the work its live premiere at the spectacular Tugendhat Villa in Brno, Czech Republic on 8 April 2019. ..sláva hvězd.. takes its name from a fictional description of ancient Prague by Alois Jirásek in his Old Czech Legends (1894), translated as ‘I see a great city, touched by the glory of stars..’ The four movements take inspiration from well known Bohemian and Czech pieces from the eleventh to nineteenth centuries, with overt, if fragmentary quotations woven into the music. I Hospodine pomiluj ny is the oldest known Czech hymn which can be traced back to the Slavonic Church. It is first mentioned in 1055 when it was sung during the election of Duke Spytihněv II of Bohemia. The hymn is an equivalent of the Latin Kyrie Eleison - Lord, have mercy on us, Jesus Christ, have mercy on us…Lord, give to all of us life and peace in our land. II Old World’s Ghost starts with a reference to the Largo movement from Dvořák’s Z nového světa (New World Symphony). As well as containing perhaps the most recognizable of all Czech melodies, it has a personal significance - I live in Shaftesbury at the top of the hill used in the 1970s Hovis advert! III Zahrajte si krásné cikány is popular throughout central Europe, also known as Black Gypsies and often performed by solo accordion in the style of a slow tango. The tango feel can be felt throughout my interpretation, with the central section entitled ‘A deep lament for the lost’, referencing the Romové (Czech Roma gypsies) who were a main target of Nazi extermination programmes and the subject of forced relocation during the Communist era. IV Spi mé malé poupě is a traditional lullaby first published in 1630 in Informatorium maternum by Iohannes Amos Comenius. Its title translates as Sleep, my little rosebud and the first verse continues Sleep little pigeon, Sleep for a good while, An hour, three, four, Baby, hence my English title. The music is fast and quirky, an unpredictable pigeon dance rather than a lilting lullaby. (Tomáš Klement is a soloist and a chamber musician who has performed concerts in the Czech Republic, Germany, Italy, Poland, United Kingdom, and the USA, and has formed regular partnerships with players from the BBC National Orchestra of Wales, Orchestra of the Welsh National Opera, City of Birmingham Symphony Orchestra, and the Bergen Philharmonic. 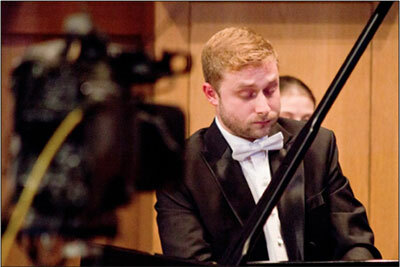 He has appeared numerous times as a soloist with the Janacek Philharmonic Orchestra, and several of his performances have been broadcast on Czech Television and Czech Radio 3, for which he made several recordings. In 2014, he released a critically acclaimed debut solo album, Contemplation of Life, under the EITO Music label. 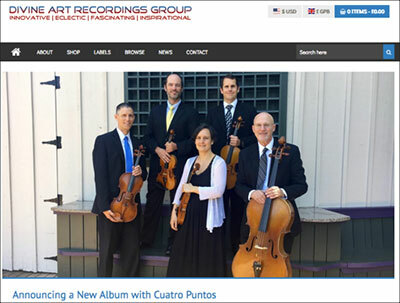 I am thrilled that Kevin Bishop and Steve Larson have included my viola duo The Oldest Song in the World on Cuatro Puntos’s forthcoming album to be released by Divine Art in March 2019. 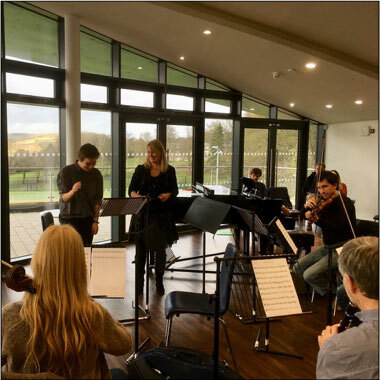 Programme note: This brief work for 2 virtuoso violists was written at the request of violist and Director of Cuatro Puntos, Kevin Bishop, as part of a concert programme entitled Near East in America. It weaves together two ancient Arabic sources, the ancient Syrian Hymn to Nikkal reputed to be the oldest notated song in the world dating from c. 1400 BCE, and لما بدا يتثنى (Lamma bada yatathana: When she begins to sway) which was written sometime in the 9th-10th centuries ACE. The lyrics of both songs celebrate women - the Hymn praises Nikkal, the Semitic goddess of fertility and orchards, and لما بدا يتثنى compares the beauty of a lover to the swaying branches of a tree. DA writes: Divine Art Records has announced its latest signing which will result in the release in early summer on the Metier label of a fascinating album of music inspired by the sounds of the Near East, performed by the Resident Artists of Cuatro Puntos. 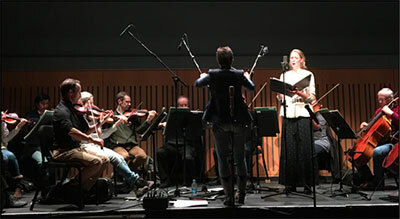 Each track comes from a personal collaboration or association between Cuatro Puntos musicians and composers or other musicians from the Near East region. The tracks are arranged roughly by their origin on a path beginning in India and concluding in Egypt. The disc opens with Jaunpuri (Morning Song), a composition by Cuatro Puntos musician Kevin Bishop. It is inspired by a personal association with two special Hindustani classical musicians while they were all living in Afghanistan. At the center of the album are Reza Vali’s Love Songs and Calligraphies No. 1-3, based on traditional Persian modes. Sandwiched between these works is another by Kevin Bishop – this one a suite of Afghan tunes on which he plays the zerbaghali. 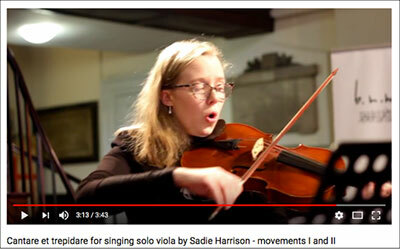 Next is a piece gifted to Cuatro Puntos by Sadie Harrison, composer of the recent Rosegarden of Light album. It is based on the oldest known written piece of music, found in Syria and dated to 1400 BCE. Concluding the album are pieces by Israeli American composer Gilad Cohen and Egyptian composer Mohamed Aly Farag, both of whom began relationships with Cuatro Puntos after their pieces were chosen from an international score call. Lili Boulanger, Amy Beach, Rebecca Clarke, Judith Weir and Grace Williams. Aurea Luce was released on Divine Art/Metier in October 2017. Programme note: Aurea Luce was written at the request of Madeleine Mitchell by way of celebrating my 50th birthday at a concert in my home town of Shaftesbury, Dorset. The work is based on a plainsong melody sung as a hymn for the Feast of St. Peterʼs Chair in Rome, reflecting the dedication of the church in which the premiere took place. I started writing the work on International Womenʼs Day 2015 and it was serendipitous that the hymnʼs text is ascribed to a 5th century female author, Elpis (reputedly the first wife of the philosopher Boethius). The title translates asʻ..with golden light..ʼ and in context within the verse it reads as: Aurea luce et decore roseo, lux lucis, omne perfudisti seculum, decoran caelos inclito martyrio hac sacra die, quae dat reis veniam. (The Poissy Antiphonal, fol. 412v) (The beauteous light of Eternity hath flooded with blissful fires this golden day which crowns the Prince of the Apostles, and gives unto the guilty a free way to heaven). 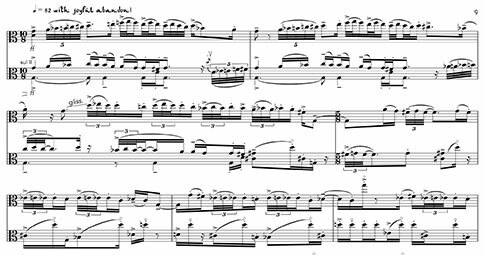 The piece states the plainsong clearly at the beginning, with a gradual accumulation of bells (constructed from patterns taken from St. Peterʼs Church bell changes) making conscious reference to the tintinabulation style of Arvo Pärt. It also hints at James Macmillanʼs Kiss on Wood which was written especially for Madeleine and which has become one of her ʻcalling cardsʼ. The work was premiered on 19 September 2015 at St. Peterʼs Church, Shaftesbury by the dedicatees, Madeleine and Geoff. Katherine Clarke will be performing Allah Hu! 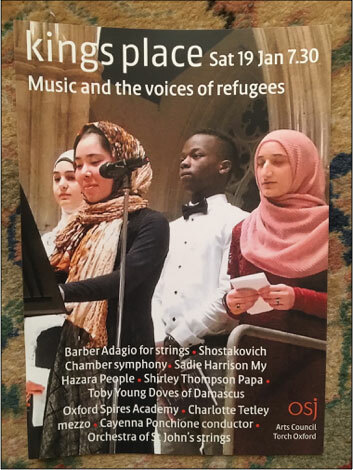 for solo viola in All Saints Parish Church, High Wycombe on 4 March 2019. Katherine has performed the work several times before - how lucky I am to have such a fine performer who is happy to perform a work so many times! Allah hu! is the central movement of a work entitled Dast be Dast (Hand to hand in friendship) which was commissioned by the American ensemble Cuatro Puntos for their violist Kevin Bishop, and for Samim Zafar, a student rubab player at the Afghanistan National Institute of Music in Kabul. Dast be Dast celebrates the diversity of Afghan and Western music-making, with both instruments exploring improvisation alongside notation, controlled imitation with spontaneous elaboration, and Western tonality within Afghan scales. The complete work was premiered by the dedicatees, Kevin and Samim on 23 June 2014 (joined by tabla player Madhurjya Barthakur) at the French Cultural Centre in Kabul. 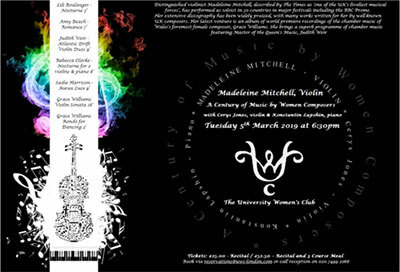 Allah hu is a meditative movement for solo viola, based on a specific interpretation of the traditional melody sung as a lullaby by Veronica Doubleday in 2004. The work was recorded by Kevin Bishop for Toccata Classics (TOCC0342) on the album The Rosegarden of Light. 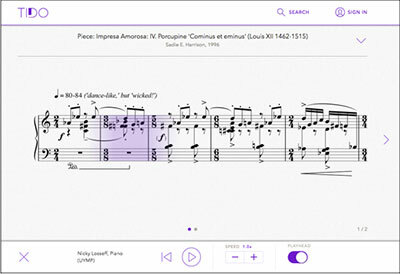 UYMP writes: UYMP is excited to announce that an innovative, interactive version of the piano collection Pianthology is to be released by Tido Music. This is the first release from the UYMP catalogue on Tido. Tido has launched a new, interactive version of this piano collection of 7 contemporary pieces of music, which are for students of Grade VIII to Diploma standard and are ideal for the final recital of a degree. Tido Music is an inspirational, all-in-one resource and learning tool for pianists and singers of all abilities, available as an iPad app and via desktop browser. Scores on Tido Music are optimised for digital devices and synchronised to professional audio recordings, enabling users to listen, adjust the tempo if they wish, and practise with the recording. A range of annotations are available to mark up and personalise the scores, and in-built metronome and recording tools make practice more efficient, convenient and rewarding. Thanks to Tido’s proprietary technology, the app even listens to users as they play and turns the pages of the score automatically!. My reworking of four of the texts maintains much of the original vocal music with the viola taking the part of an other canonic voice, a hurdy-gurdy or a medieval fiddle. My Hazara People is a setting of two texts, the title work by Shukria Rezaei and Lalai, lalai, bobe bacha shikar rafta (Baby’s father went hunting), a traditional Hazari lullaby. Although their characters are entirely different, the two poems share much in common. The importance of family and home and the connection with country and heritage are at the centre of both. Shukria’s poem is a direct expression of love and despair for Afghanistan with intimate moments of terror - a cup falling from her mother’s hand during an explosion, her aunt fainting - set against the suffering of Hazaras across the world. In the context of this devastating contemporary experience Lalai lalai is nostalgic and poignant - open gates, straw latches, a sleeping child. The tune of the lullaby is heard in two highly contrasted versions. For Shukria’s words it is dark and restrained, a repeating rhythm illustrating the Hazara’s seemingly never-ending pain, and for Lalai lalai it is bright and joyful with sounds of the hunt, a crackling fire and a gentle chorus as the child is rocked. A further thread runs through the music - a quotation of my favourite traditional Afghan Herati lullaby Allah Hu (God is great), reflecting Shukria’s reference to her people’s religious heritage. I have adapted the text at the end of Lalai Lalai to bring it into the Shukria’s world, a reminder that each innocent person caught up in conflict is a mother, a brother, a sister, a father, a daughter….kids like us.